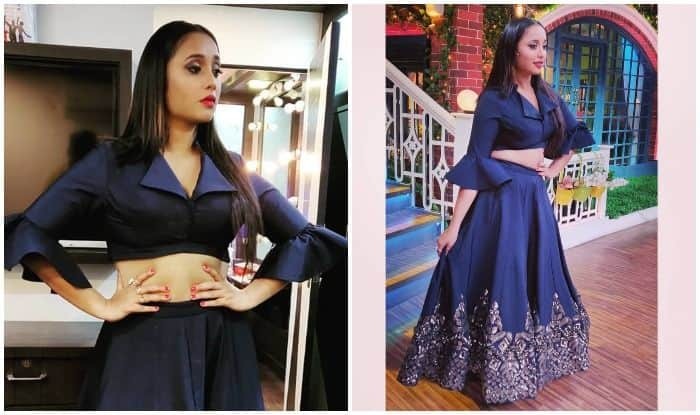 Always slaying with her impeccable dance moves and on point sartorial choices, Bhojpuri sensation Rani Chatterjee looked smoking hot as she shared her look for a comedy show. As if she was not dressed enough to kill, Rani’s expression in the picture made fans go crazy and set Internet on fire. Seen donning a navy blue cropped blouse with bell sleeves and a similar colour skirt with glittery work at the bottom, Rani contrasted it with pink heels and nailpaint, along with a luscious pink tint on her lips. Posing for the camera while looking away from it, Rani looked sensuous. She captioned the picture with the backdrop of the show’s dressing room as, “Today watch…#thekapilsharmashow 9 30….aaj dekhiye..” (sic). Today watch…#thekapilsharmashow 9 30….aaj dekhiye..
She even shared glimpses from the show which seemed to be on roll the night before as she shook a leg to her songs, while fans even crooned her their favourite romantic Bollywood numbers.